“Where’s my son?” asks Joe West (Jesse L. Martin). “Has he gone missing?” responds DeVoe (Neil Sandilands). “He’s not missing – he was taken,” replies West as he tries to find Barry after hearing from Iris that DeVoe ambushed and kidnapped him in The CW’s season four episode nine of The Flash. As the episode begins, it’s Christmas time in Central City. At S.T.A.R. Labs, Cisco (Carlos Valdes) and Harry Wells (Tom Cavanagh) fight over how to decorate a blue Christmas tree. 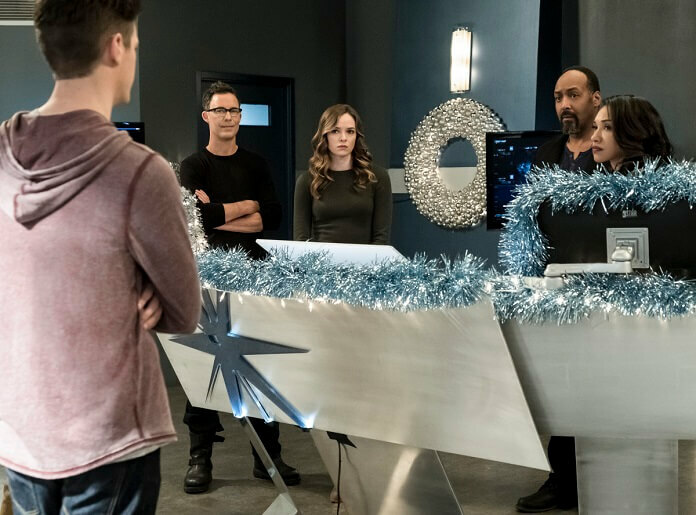 Caitlin (Danielle Panabaker) and Ralph (Hartley Sawyer) arrive and things don’t stay festive long after Caitlin finds out Cisco, Harry, and Ralph have been spending some social time with her alter ego, Killer Frost. They now have inside jokes with Frost, and Ralph flat-out tells Caitlin he likes Frost way better than her. Feeling hurt, Caitlin leaves saying she’s off to get some coffee. Cisco and Harry realize she’s upset. At Barry (Grant Gustin) and Iris’s (Candice Patton) apartment, the newlyweds are opening their wedding presents. Barry notices one that has no label and is just a single knife. Iris notices Barry hasn’t been using his speed and he tells Iris since he came out of the Speed Force and has been back, he’s felt at peace and doesn’t need to use his speed when he’s with her. Iris also expresses her irritation at Oliver and Felicity intruding on their wedding day by also exchanging vows. Over at Jitters, Catlin’s sitting alone pouting and feeling blue when Harry arrives and tries to cheer her up. She’s not happy about the new drink named after her alter ego and feels as though everyone – even her closest friends – think Frost is a cooler person to hang out with. Harry assures Caitlin she’s special and that her friends would much rather be with her than Frost. She’s just beginning to smile when the front door to Jitters is smashed to pieces and Amunet (Katee Sackhoff) walks in looking for Caitlin. Harry tells Caitlin to hide and tries to stop Amunet, but she quickly destroys his gun. Before Catlin can change into Frost, Amunet straps on her power-dampening cuff and takes her away to an abandoned hospital. Meanwhile, Barry and Iris are out for a walk when DeVoe (in his hover craft) attacks. He blasts Barry but he quickly recovers and moves Iris out of harm’s way. Barry begins to fight DeVoe only to be knocked out this time by the octopus-like tentacles attached to the craft. He grabs Barry and flies off with him. Iris runs to S.T.A.R. Labs and tells the gang what happened to Barry. She’s informed Amunet has kidnapped Caitlin and Ralph points out that’s a strange coincidence that both have been taken. Cisco quickly tells him to shut up. Iris instructs Team Flash to start trying to locate Barry and Caitlin using the S.T.A.R. satellite to check for the Speed Force in Barry as well as Caitlin’s special cold DNA. Barry wakes up in an energy field-powered prison in The Thinker’s lair he’s unable to escape. Over on another side of town, Amunet has taken Caitlin to help save a new meta who has mind-reading capabilities. The meta named Dominic (Kendrick Sampson) has a piece of metal stuck in his neck, thanks to Amunet capturing him. If it’s not removed just right, he’ll die. Initially, Caitlin refuses to do the procedure but when Amunet says she’ll just have to try ripping it out herself, Caitlin agrees to try. Pleased, Amunet warns Caitlin as she walks out of the room that if she fails and he dies, she’ll kill her too. When he wakes up from the sedative, Dominic asks Caitlin to help him and he accidentally reads her mind. He learns she thinks Killer Frost could get them out of this, but she can’t get the power-reducing cuff off. Dominic tells Caitlin that Amunet is crazy enough and he’ll take his chances with her. While Barry’s trying to figure out a way out of his cell, DeVoe shows up in his hover chair and taunts him. Barry asks what he wants and DeVoe tells him he should learn humility and that it will help him with what he’s soon to face. Barry hears a knock and sees on a monitor that Joe’s outside DeVoe’s house. “Seems we have a guest,” says The Thinker as he hovers away. Barry yells after him not to hurt Joe. Down in The Thinker’s lair, Barry’s still trying to escape when DeVoe wife’s, Marlize (Kim Engelbrecht), tells him he’ll only hurt himself. Barry tries to reason with her, insisting she could endanger her marriage if she goes along with Clifford’s plans. She confirms she’s devoted to Clifford and reminds Barry that his body may be stronger than her husband’s, however her husband out-think him any day of the week. Harry returns to S.T.A.R. Labs with no new leads on Barry. Cisco and Ralph get in a fight over what he said to upset Caitlin that caused her to be a target for Amunet since she was alone at Jitters. Iris breaks it up and the two men retreat to sulk. Harry informs Iris she’s the real reason they’re fighting and that they’re exhausting their manpower and tools trying to find both. Harry tells her she has to choose to look for one or risk losing them both. Not wanting to choose between her husband and her friend, Iris refuses. Back at the old abandoned hospital, Caitlin and Dominic try to make a break for it but get caught by Amunet. Amunet tells her armed thugs to take Dominic back. Instead of hurting Caitlin, who she sees is feeling powerless without her Killer Frost persona, she gives her a pep talk telling her she could have kidnapped any doctor in town but chose her because she knows she’s the best. She reveals to Caitlin that before she became an underworld boss, she was a flight attendant who was being harassed by the pilots she worked with. Once the particle accelerator exploded, she used her new powers to show them the error of their ways. Amunet assures Caitlin she was special before she ever got powers. She knows Caitlin is the only one who can save Dominic’s life. Back at S.T.A.R. Labs, Cisco and Ralph apologize to each other and Iris finally makes a decision to look for Caitlin who she says is vulnerable right now. Iris believes Barry can take care of himself. Caitlin manages to pull together enough usable equipment to perform the procedure. After she successfully pulls out the piece of metal, Dominic goes into shock and his vitals drop. She starts to do chest compressions and that’s when Amunet’s armed thugs drop to the floor unconscious. Caitlin and Dominic make a run for it. Amunet makes a fairly quick recovery and chases after them, using her powers to fling metal shrapnel at Caitlin. Ralph and Cisco show up through a breach and Ralph, being the Elongated Man, gets in front of Caitlin and takes the hit. The metal bounces off him. Cisco hits Amunet with a power blast and they all escape through the breach. DeVoe checks on Barry and finds his power prison empty. “Impossible,” says DeVoe as he turns off the cell. Barry appears and speeds out of the cell. DeVoe realizes he’s been tricked and that Barry vibrated so fast that to the naked human eye it seemed he wasn’t there. Barry and DeVoe fight, with DeVoe’s hover chair flying them across Central City. Finally, Barry’s able to trick the octopus-like tentacles to attack the chair itself. Down the two go with Barry saved by the raft function activating before he hits the river while DeVoe and his chair crash into the water. Back at S.T.A.R. Labs, there seems to be no trace of DeVoe or his wife in town. Joe admits he hasn’t had time to decorate the house for Christmas with everything going on and asks if they should skip the yearly Christmas Eve party. Barry says no because they have a lot to celebrate. When Barry and the others walk into the house, they find Ralph has gone all out (a little too much, maybe) to decorate and he tells them he wanted to doing something nice for his friends. Ralph then apologizes to Caitlin for saying he liked Frost better and tells her she’s the best as far as he’s concerned, which makes her smile. Dominic shows up and Cisco nicknames him Brainstorm. The celebration’s interrupted when Barry gets an alarm alert at his apartment and heads home to check it out. Suspenseful and surprising, episode nine titled “Don’t Run” has two of the major characters in the series being kidnapped by their current nemeses and having to rely on their intellect rather than their powers to escape. 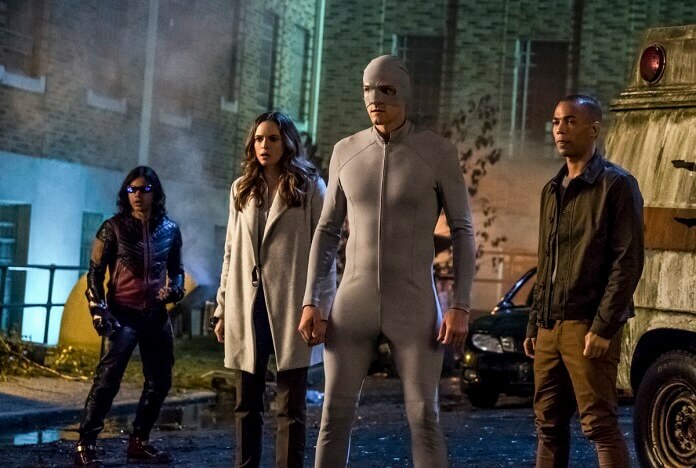 It’s a solid episode reinforcing the fact Barry and Caitlin are extremely smart heroes who can get out of dangerous and dire situations on their own, rather than needing to be rescued. There are two stand-out performances in this episode. The first was delivered by Danielle Panabaker as she shows Caitlin’s vulnerable and sensitive side as well as her craftiness and caring side while trying to care for her patient, Dominic. She’s absolutely not another damsel in distress and comes up with a way out of her situation all on her own, only needing the help of her friends to complete the escape. This once again shows Caitlin is not just the heart and soul of Team Flash but also one of the smartest members as well. The second stand-out performance came from Katee Sackhoff as the underworld boss, Amunet. The humor she injects into the character and how she almost shows a sign of genuinely liking Caitlin make her an entertaining and intriguing villain. The two actresses have solid chemistry and their scenes together were some of the best in the episode. With Barry now arrested for a murder he didn’t commit (like father, like son), it’s going to be up to Team Flash to find a way to clear Allen’s name – hopefully without revealing his identity.